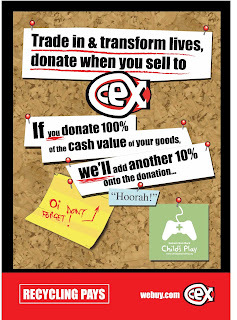 You can now choose to donate to charity Child’s Play when you are selling your old games, phones, DVDs and gadgets to CeX. This is available both in store and online. Child’s Play is charity dedicated to improving the lives of children with toys and games in a network of over 70 hospitals. When selling any item to CeX just choose the amount wish to donate to. We will make your donation in full to Child’s Play. Better still, if you donate 100% of the value of your stuff in one transaction we'll add 10% to the value. Recycling your old items to CeX will help the environment, as well as this immensely deserving Charity. Start selling to CeX and help transform lives here.